Building the bike would teach me how to maintain the bike on the road (in theory). 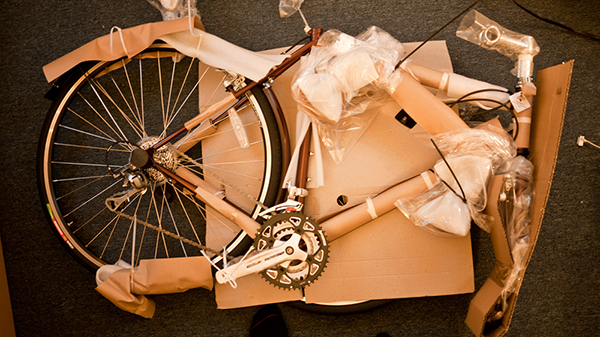 I would have the box to repack the bike and put it on a plane. I hadn’t set up derailleurs before, so that took the most time. To a single speed rider like myself, a touring bike looks like The Homer. But I was able to get past my cable-and-doohickey aversion and learn a whole lot in the process. 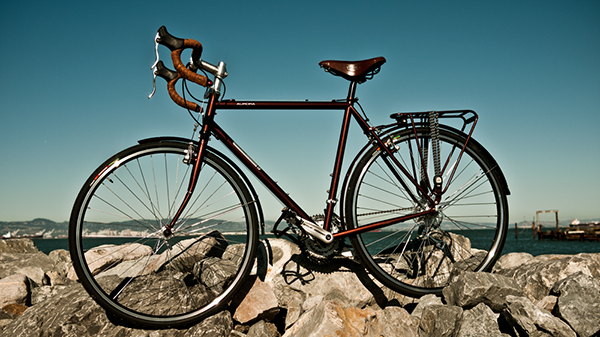 The 2012 Jamis Aurora comes with mostly decent components, with a few glaring exceptions. The pedals are absolute garbage. They’re plastic with plastic toe cages and nylon straps. Only the most casual of casual riders would be caught dead using these things. And then there’s the saddle assembly. The saddle is powerfully ugly. Why they couldn’t ship the bike with a basic black saddle is beyond me. The Aurora ships with a seat post that is known to be faulty. I found several forum posts with disgruntled customers griping about how at maximum tightness, their seat still slid around freely. I adjusted my seatpost height, tightened the bolt as well as I could and the seat post still slid from side to side. Frustrated, I stripped the bolt trying to get it tighter and then ultimately trying to get it off. Luckily, I have a Dremel tool. I cut off the bolt at the center, where there is a break in the frame to clinch the post. The built-up tension caused the bolt to soar across the room once it was finally split in half. It was doubly satisfying to cut the damned thing off. After that, I walked over to my LBS planning only to buy a seat post that actually fit. Instead, I walked out with a new saddle as well. I’ve never had the pleasure of owning a Brooks saddle, and this seemed like a fitting time to try one out. With a new saddle, it’s a nice looking bike. Once I had the bike totally set up, I took it for a spin. At 5’9″, the 55cm frame is about as big as I would ever want it to be. It’s certainly at my upper-limit as far as comfort goes. But I’m satisfied, and ready to see what this thing can do. I have a friend who went hunting every day for a whole season without finding a deer to shoot. This is a true story. He was driving home one day and found a dead deer on the side of the road. It was freshly killed, steam rising in the morning air. At any rate, he decides that this is his deer, regardless of how it wound up becoming an ex-deer. He tried at first to lift it away from his body so that he wouldn’t be covered in deer bits, but it was far too heavy for that strategy. Instead, he had to bear hug the thing in order to drop it into the trunk of his tiny Hyundai. I don’t remember if the trunk closed all the way, but either way it’s a pretty unique visual image. At any rate, he gets the carcass home and drags it into the back yard on a big blue tarpaulin. And then he walks inside and looks up a YouTube video on how to field dress a deer. Once outside, he performs the process. After that, he went back to the computer to learn how to harvest the meat. And then he repeated the process again to skin it. Mind you, I wouldn’t had believed this story if it had come from someone unreliable. YouTube is amazing.